Slovak fascist politician Vojtech Tuka was hanged on this date in 1946 by the postwar Czechoslovakian government. A lawyer, academic, and journalist, Tuka spent the decade leading up to World War II in prison for inciting Czechoslovakia’s Slovakian half to break with the Czechs. 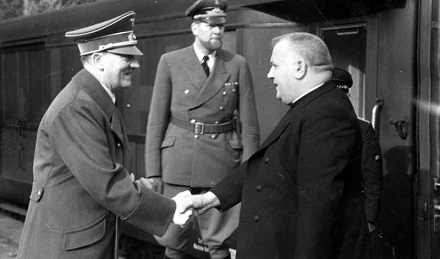 These calls found their footing in 1938-39 when the Third Reich’s expansion crippled Czechoslovakia; a newly autonomous Slovak region under Prime Minister Jozef Tiso soon began pushing for outright independence. 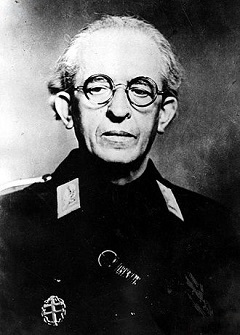 In fact, one of the last actions of the pre-war Czechoslovakian state was to deploy troops to occupy Slovakia under martial law and (momentarily) depose Tiso on March 9, 1939. This desperate attempt to preserve Czechoslovakia was the action triggering Germany’s outright takeover of Czech territory. Tiso was in full support, and in reward he got restored as leader of the now “independent” Slovakia … in reality a German client state. Tuka was right there for the ride. But that decade in prison had not done Tuka’s health any favors. He suffered a stroke late in the war, and emigrated, wheelchair-bound, to Austria. He was arrested there and returned to Slovakia; by the time of his trial, he had suffered multiple strokes and was partially paralyzed. Nevertheless, he was condemned as a war criminal for throwing Slovakia into war against the Soviet Union and for the defeated Slovak Republic’s anti-Jewish measures. * Dieter Wisliceny, an Eichmann assistant, was a key German liaison to the Slovaks.